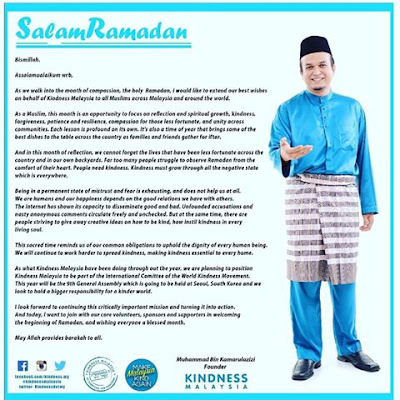 As we walk into the month of compassion, the holy Ramadan, I would like to extend our best wishes on behalf of Kindness Malaysia to all Muslims across Malaysia and around the world. As a Muslim, this month is an opportunity to focus on reflection and spiritual growth, kindness, forgiveness, patience and resilience, compassion for those less fortunate, and unity across communities. Each lesson is profound on its own. It’s also a time of year that brings some of the best dishes to the table across the country as families and friends gather for iftar. And in this month of reflection, we cannot forget the lives that have been less fortunate across the country and in our own backyards. Far too many people struggle to observe Ramadan from the comfort of their heart. People need kindness. Kindness must grow through all the negative state which is everywhere. Being in a permanent state of mistrust and fear is exhausting, and does not help us at all. We are humans and our happiness depends on the good relations we have with others. The internet has shown its capacity to disseminate good and bad. Unfounded accusations and nasty anonymous comments circulate freely and unchecked. But at the same time, there are people striving to give away creative ideas on how to be kind, how instill kindness in every living soul. This sacred time reminds us of our common obligations to uphold the dignity of every human being. We will continue to work harder to spread kindness, making kindness essential to every home. 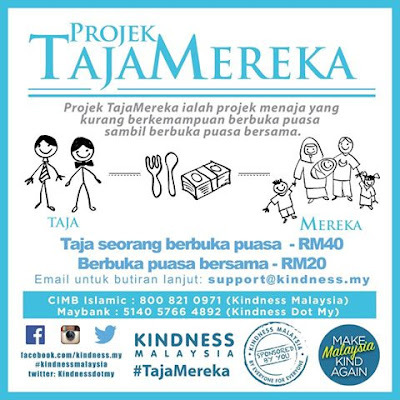 As what Kindness Malaysia have been doing through out the year, we are planning to position Kindness Malaysia to be part of the International Comittee of the World Kindness Movement. This year will be the 9th General Assembly which is going to be held at Seoul, South Korea and we look to hold a bigger responsibility for a kinder world.